Home » Activities » Christmas » Best building toy yet…. 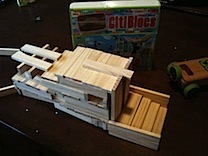 This will surprise you, but Citiblocs are just a bunch of pine blocks, all cut in 1 X 4.5 X 1/4 inch rectangles. But they are perfect for creative play for little hands, and dads. When I opened the box, I was surprised not to find extra pieces like triangles and rounded edges. Citiblocs has none of that. They are just simple blocks. But my son (5) loved them. He built a house right away and explained all the crazy features it had. Unlike Legos, he wasn’t locked into a rectangular or almost literal representation of something, so he felt more free to let things hang out and let his imagination take over. While my classic design at steps that lined up perfectly and involved some fine engineering to support an overhanging porch, his was more figurative. I was a bit dismayed when he dissembled my colonnaded entryway to our house, but I overcame my frustration to let him just play the way he wants to play. The only solution though for next time is to buy another set so he can build his dream house and I can build mine. Set of 100 for 27.50 at Amazon. Larger and smaller kits available as well.